Without a proper heating and cooling system, your home could quickly become unbearable. So you should look into getting an HVAC system. But what are the types of HVAC systems available? In this article, we show you 4 of the most popular HVAC options. This type of HVAC unit is called a split system because it has both an outdoor and an indoor unit. The outside unit has the compressor and condenser, and the indoor unit has the blower and evaporator coil. This kind of system is the most popular kind of HVAC system. With a split system, you’ll often connect it to a furnace. Or you can connect it to a heat pump. Generally, a split HVAC system has a series of pipes which circulate refrigerant between the indoor and the outdoor unit. It also has an evaporator coil, which is usually located above the inside furnace. With a split system, you can control the temperature in your home using a thermostat. On older models, the thermostat is simply a dial. But more modern systems have digital control panels. If you have a hybrid pump system, you have a heat pump that’s used alongside a furnace. The furnace is powered by natural gas or propane. 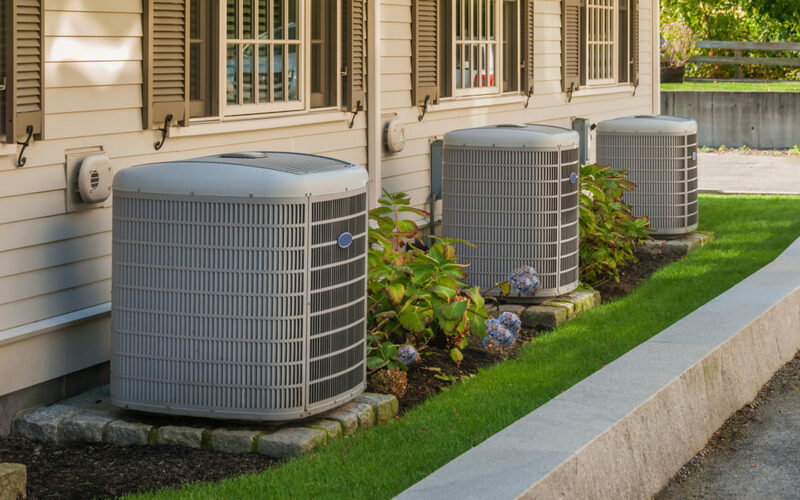 Heat pumps are effectively air conditioners that reverse their function to heat up your home. If the temperature drops below 40 degrees, your heat pump becomes less efficient. When it gets this cold, the system will use the furnace to heat your home. When it isn’t too cold, this kind of system can work very efficiently by taking the warmth from the outside air and transferring it into your home. If you have a living situation where a traditional duct-based HVAC system isn’t feasible, you could have a ductless system. You can also use this kind of system in conjunction with another HVAC system. For example, if your current HVAC system isn’t heating and cooling one particular room in the house, you could install a ductless HVAC system in that room. Since there are no ducts involved, installing this kind of system isn’t as difficult as other kinds of HVAC units. A packaged HVAC system has the compressor, evaporator, and condenser all within a single unit. The unit is often located on the roof of your property. If you have limited space to install an HVAC system, it often makes sense to install a packaged unit instead of a split system. Packaged HVAC systems often include a furnace or electric coils for heating. Now you know the types of HVAC systems you can get for your home. Choosing the right HVAC system can lead to more energy efficiency and can save you money in the long-run. If you’re unsure which kind of system would be best for your situation, you could always ask for the opinion of a reputable HVAC company. By employing the help of an HVAC service provider, you’ll not only get good advice, but you can also get service that’s safe and effective. Need help with your HVAC project? Then get in touch with us!